Bunnies celebrating the holidays dressed up in their favorite festive accessories. 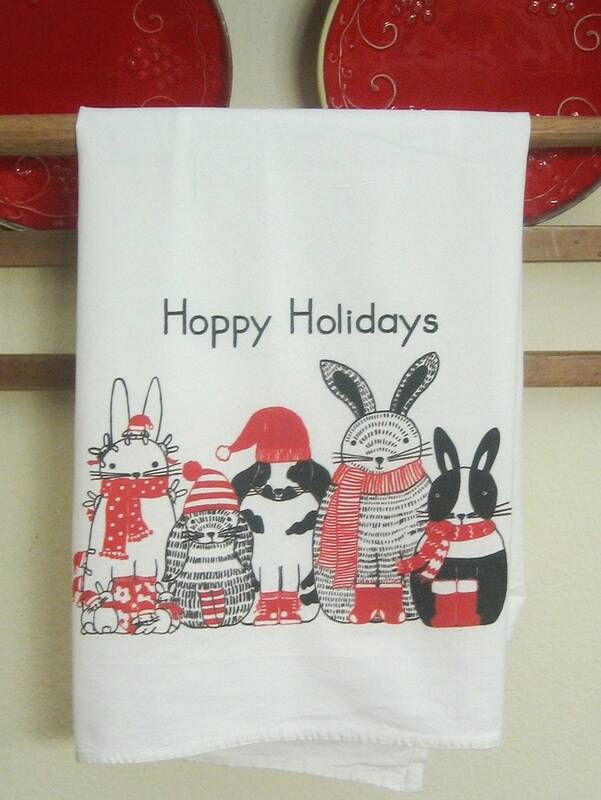 Printed on large (29x29), nice quality, white, cotton kitchen towel from original illustration. Design as appx 10" across printed bottom edge of towel, center, meant to be shown when towel is folded, hanging on oven door or rack. 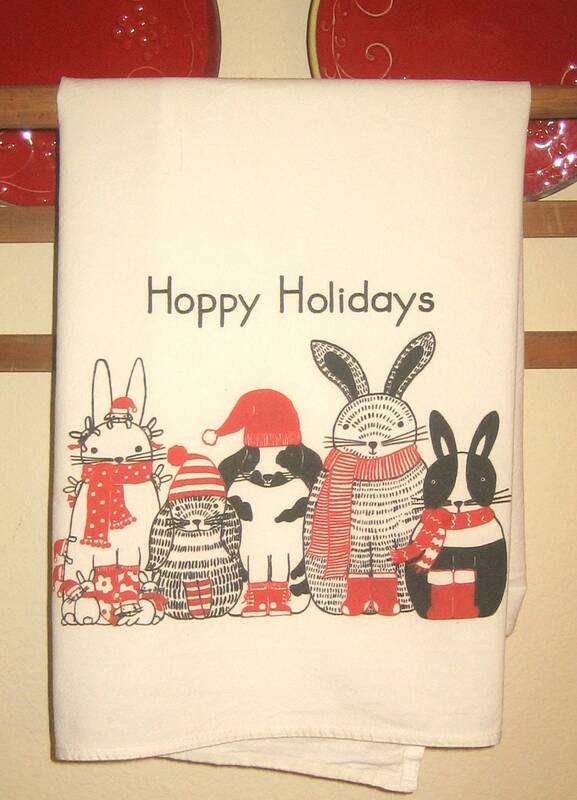 For extra fun, add Happy Howlidays and Mewey Christmas towels, especially if you have cats and dogs. TEMP OUT OF STOCK. WAIT IS 1 WEEK TO 10 DAYS AFTER PLACING ORDER. Payment to my shop is through PayPal, check or credit card. Customer is notified as soon as possible when order has been placed and order is shipped 1 to 5 days after payment is received. If for some reason there will be a delay customer will be notified and always has the option to cancel. Customer can always pay for overnight shipping if they choose. Customer will be notified as soon as order is shipped. Exchanges for different sizes are accepted as well as returns for refund, as soon as item is returned by customer. I will always consider a request for original art but typically prefer working with designs in my shop. For example, if a customer would like a design shown in my shop printed on an item it is not currently printed on, if I can make it work, I will. Wholesale orders are accepted with a start up minimum which then is 6 or 12 piece. If you need more of an item (and only 1 for example is listed) let me know and typically I can print more for you. Wait will be a week to 2 weeks.